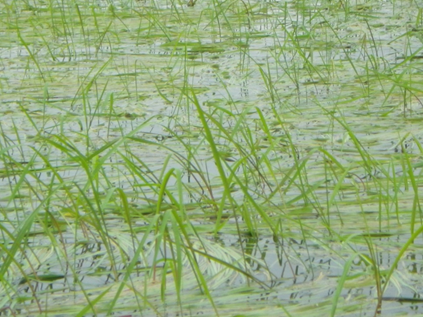 Minnesota has more acres of natural wild rice (Zizania palustris) than any other state in the country. Wild rice has been historically documented in 45 of Minnesota's 87 counties and in all corners of the state. Anecdotal information suggests an even broader distribution prior to European settlement. Wild rice is an important social and cultural component for Native American tribes and rural Minnesota communities. Wild rice is a persistent annual grass that reproduces each year from seed stock deposited in previous fall seasons. The plant typically grows in shallow to moderate water depths (1 – 3 feet) and is affected by water flow, turbidity, water quality and water level fluctuations. Wild rice is sensitive to varying water levels, and production in individual stands from year-to-year is highly variable depending on local water conditions. Wild rice beds are very attractive to migrating waterfowl, and many rice areas are traditional waterfowl staging and hunting areas. Although many of the larger wild rice beds are actively managed, there is a perception that rice abundance and distribution have declined over time, especially in many of the smaller beds along the margins of lakes and streams. 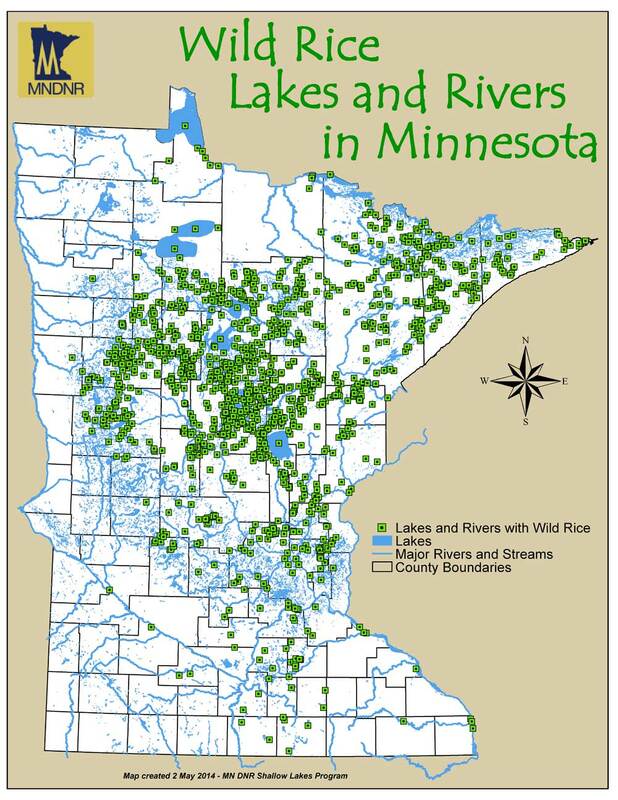 A DNR assessment found over 1,200 lakes and rivers in 54 counties that currently contain or historically had wild rice. Over 64,000 acres of wild rice (out of roughly 2 million basin acres) were found on these waters. More than half of the acreage was found in Aitkin, Cass, Crow Wing, Itasca, and St. Louis counties. There are no similar historical summaries of wild rice distribution in the state, so there is no suitable method to assess changes in the extent of Minnesota's wild rice beds. A 1966 inventory estimated 15,000-30,000 acres of wild rice annually in 150 large beds, plus an additional several hundred smaller beds. Observations indicate that production on many traditional wild rice areas, especially those without active water level management, has been poor in recent years. The number of wild rice harvesting licenses purchased annually may provide an indication of rice abundance. The number of licenses sold has generally decreased since 1957, when the licenses were first required, from an average of 10,300 per year in the 1960s to 2,000 per year in the 1990s to 1,300 in 2002. Funds from the sale of wild rice licenses supports DNR management of wild rice, including managing water levels on wild rice lakes, improving or maintaining outlets, and assessing habitat. Tribal management of historically important wild rice lakes has expanded in recent years and has included both stand restoration and annual water level management. 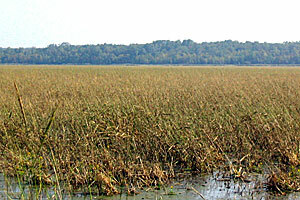 In 2001 DNR and Ducks Unlimited began a cooperative project focused on intensive water level management on a number of important wild rice lakes. That joint effort continues today. Aquatic invasive species (AIS) are a serious threat to wild rice waters. Be aware of the risks and help prevent the spread of AIS. For more information on wild rice in your area contact your local DNR wildlife manager or a Shallow Lakes Program specialist.